Cook vs. Chef: What's the Difference? There’s over a million restaurants in the United States; it takes a lot of people to cook all that food. This means a lot of jobs in the food industry, and every single one of them will touch your food in some form or fashion. 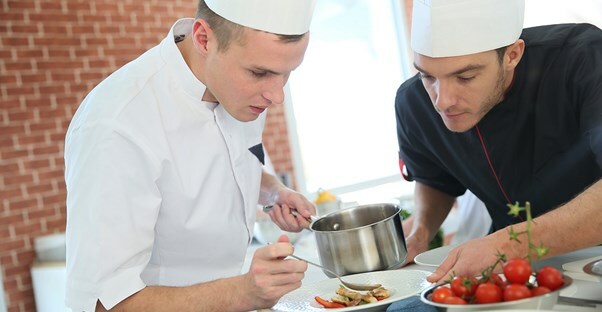 Cooks and chefs are the ones in charge of making sure it tastes amazing, but what exactly is the difference between the two culinary occupations? A cook makes food for a living - or at least combines food into something delicious to eat. They may work for a catering company, a fast food restaurant (although these take considerably less training than other positions) privately for someone very wealthy making breakfast, lunch, and dinner according to their whims, or in any different kind of restaurant you can imagine, from a chinese buffet to a steak house. Most of these kitchens have a very organized staffing system, and a cook may do one or more of several things. Someone is needed to get all of the food prepared - cutting vegetables and meat, making sauces so they’re ready to pour over pasta, and baking cakes and pies for dessert. A cook may also be in charge of making customers’ orders in a variety of positions: a fry cook (making anything from french fries to fried chicken to fish sticks), a saute chef (making different kinds of pastas and putting the final touches on pre-made foods), a broiler or grill cook (cooking meats on a flat top, broiler, or wood top or gas grill), or soup, salad, bread and dessert cook (as these are usually attended to by one person). Additionally, they may work as a “set” person or in the “expo” position. These people make sure that everyone else is cooking the right food for the right order, and making sure all the food comes together at the right time, ready to go out to hungry customers. Although a cook may be a saute chef, a chef in and of itself is very different. A chef is a highly trained and educated professional. They attend culinary schools, and may receive a degree or certificate, depending on what sort of food service they intend to go into. There are many different types of chefs. Some go to school to be bakers, while others become masters of hospitality. They might even work a hibachi grill -- although those guys usually seem a little silly and put on a good show, they have to have particular training for the position. Chefs generally lead the kitchen, acting as a supervisor, making recipes for cooks to follow and creating a menu. They are more commonly found in very nice, five-star restaurants. The biggest difference between a cook and a chef is their level of education and leadership. Chefs are trained to know what flavors will be good together and how to make a plate look nice. Cooks are generally trained on-the-job and make specific recipes the restaurant has previously decided on. A chef may come into a restaurant and bring his own recipes and change the menu frequently. While a cook may move up in the restaurant and find a management position, it usually takes years of experience. A position as a chef comes with an almost natural authority, although a cook may be just as talented as a chef.